Skip the bun! 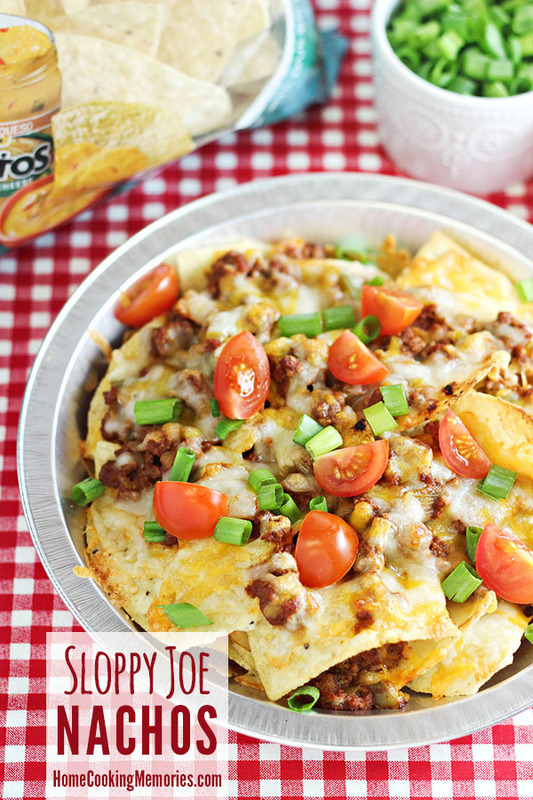 This Sloppy Joe Nachos recipe is just like the sandwiches, but MORE cheesy & MORE fun! An easy meal for any laid-back occasion – like movie night or game day. 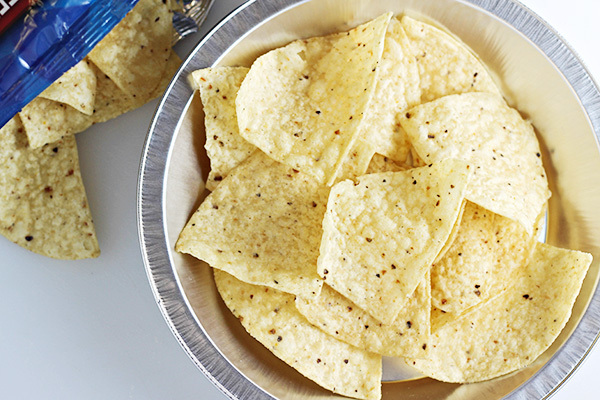 Disclosure: Thank you to Frito-Lay for sponsoring this recipe. This post contains some affiliate links for your convenience. Click here to read our full disclosure policy. It’s football season and while that fact alone is plenty enough for many of you, I know those game-day snacks are a top priority too. Who wants to watch a game without something to snack on? Not me! One of the favorite dinners in our house — especially on a game day — is sloppy joes. The kids love them, the husband loves them and bonus for me: they are so simple to make. 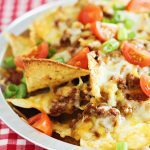 I knew that converting our sloppy joe sandwiches into deliciously cheesy and crunchy Sloppy Joe Nachos was a game day must! 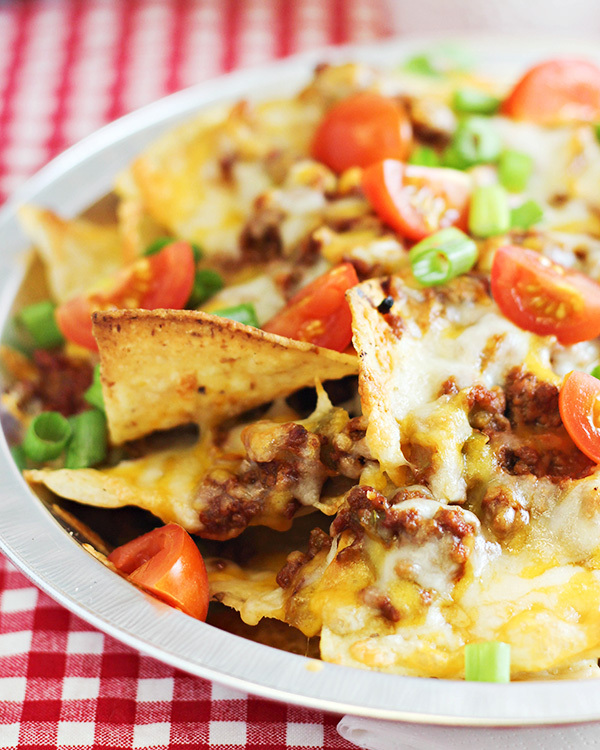 To make your own Sloppy Joe Nachos recipe, you will need a great tortilla chip. 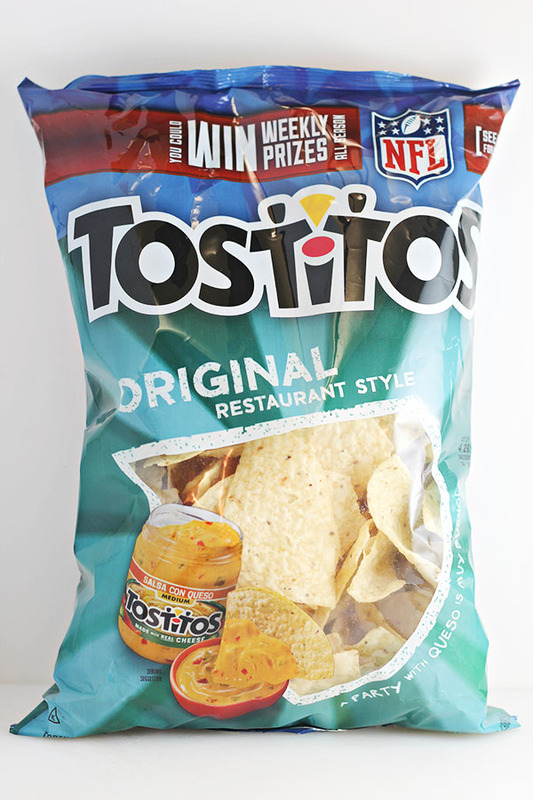 I went with TOSTITOS Original Restaurant Style Tortilla Chips, which are great for holding all the nacho layers. 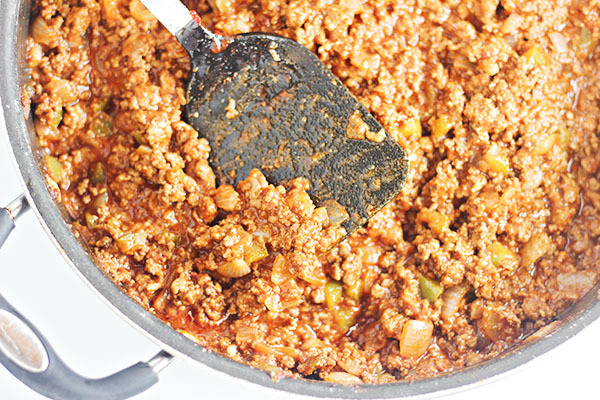 In a large skillet, you’ll cook your sloppy joe mixture. It doesn’t take that long to make, which is great because you don’t have to miss the pre-game show. And another great thing about this mixture is that it’s perfect to make ahead. Just make it the day before and heat it up before everyone wants to eat. 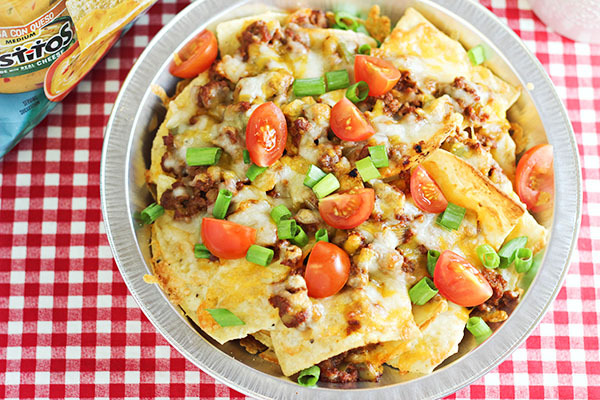 To assemble your Sloppy Joe Nachos, you’ll need an oven-safe pan. I like to serve individual batches made in pie pans. I usually use old metal pie pans that I’ve saved from frozen pies. If you don’t have any, you can either by metal pie pans or even a baking sheet to make a larger batch. 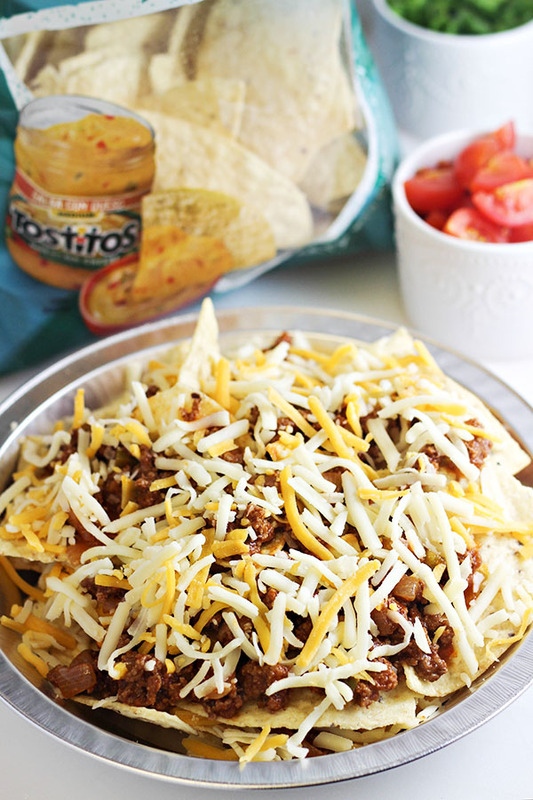 Begin building your nachos by placing a layer of chips in your pan, a couple scoops of the Sloppy Joe mixture, and shredded cheese. Then repeat the layers again. Place your pan of nachos in the oven until the cheese is all melted. Top with green onions and tomatoes, if you wish. Need a game day snack? 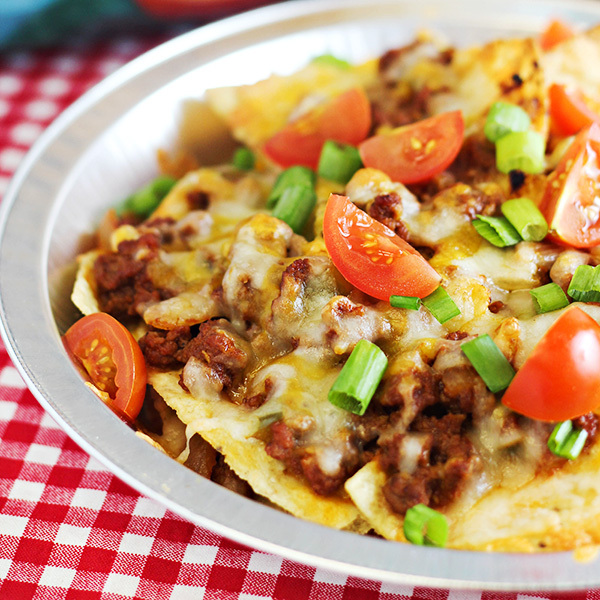 My Sloppy Joe Nachos are a fun change of pace to usual nacho recipes. In a large skillet over medium heat, cook ground beef, onions, and bell pepper until meat is brown and cooked thoroughly. Drain off any fat. While heating over low to medium heat, stir in tomato sauce, tomato paste, and water into the meat until combined. Stir in brown sugar, chili powder, garlic powder, Worcestershire sauce, vinegar, and red pepper flakes. Stir until all ingredients are combined with the meat and mixture is hot. Remove from heat. Heat oven to 400 degrees F. In a metal pie plate, place a layer of TOSTITOS, then a couple scoops of the sloppy joe mixture, followed by shredded cheese. Repeat layers. Place pan in oven and cook until cheese is hot and melted (about 5 minutes). Remove from oven and top with sliced green onions and chopped tomatoes, if desired. –Ingredients and serving size are approximate. –Any size oven-safe pan can be used. I use metal pie plates to create individual servings, however a large baking sheet can also be used, especially for serving a bigger group of people. Looks yummy! Thanks for sharing at the #InspirationSpotlight party. See you again soon. Shared. Looks yummy. Thank you for sharing with us at #HomeMattersParty. We would love to see you again next week. These look soooo amazing – thank you so much for sharing, we’ll be trying these this fall for sure! These look amazing! Must make them! Man, these look & sound so delicious! Pass me some? What a unique twist to a family favorite…both meal combinations. This will be on the menu for sure for a new dinner and I am sure I will have 3 boys licking their plates clean! Aahhhh!! What an awesome combination of 2 of our favorite foods in my family. We both love sloppy joes AND nachos! Never thought about combining the two. This recipe is definitely going on our menu for next week! Bookmarking now! Looks like a great Game Day snack! That is a yummy twist on the typical sloppy joe! This reminds me of Mexican food. Love this brand chips, it is the brand I buy.